For the most comprehensive encyclopedia look no further. The new 2010 Encyclopedia Britannica combines today� s current topics with over 240 years of expertise and delivers more depth, breadth, and information than other encyclopedias. Readers can access quick facts or immerse themselves in detailed articles on almost any subject imaginable while enjoying the vivid and beautiful images of art, geography, science, sports, and much more. 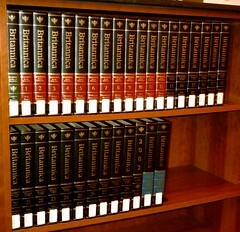 With over 1, 000 new and updated articles, over 4, 000 contributors, and 65, 000 articles, the 2010 Encyclopedia Britannica is unsurpassed. New and extensively revised articles cover the latest on school subjets, such as Blog, Global Warming, The Artic, Human Genome Projects, Conservation of Species, Chemical Weapons Convention, Artificial Heart and Skateboarding, to name a few. Other notable revisions include Australia, Sydney, Australian External Territories, Asian Peoples and Cultures, New Zealand, East Timor, Gaza Strip, and Ho Chi Minh City. New biographies of major world leaders include U.S. President Barack Obama, Pope Benedict XVI. Prime Minister Kevin Rudd, Prime Minister Gordon Brown, Dalai Lama XIV and Russian President Dimitry Medvedev. Other new and revised biographies include Gary Ablett, Roger Federe, Jorn Utzon, Miles Davis, and many more. More than 24, 500 carefully researched and selected photos, maps, and illustrations hold the interest of readers and complement the in-depth articles. Written by Nobel laureates, historians, curators, professors, and other notable experts, the Encyclopedia Britannica is a trusted resource with a balanced and global perspective. Includes bibliographic citations where users are pointed to additional information sources for further research.